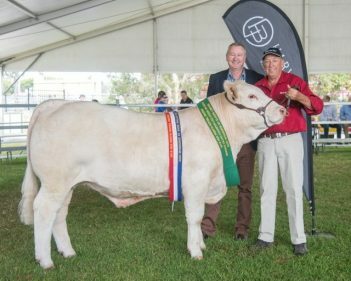 Harvey Beef was once again delighted to secure the winning bid of the Grand Champion Steer at the annual cattle auction at the IGA Perth Royal Show. First into the ring was the grand champion of show, a Gelbvieh-Murray Grey steer, bred and exhibited by Murdoch University and auctioned by Cameron Petricevich, S & C Livestock. Weighing in at 384kg with 11mm fat at P8 after 100 days on feed, it sold for $4800. Harvey Beef also purchased the Black Dog Ride steer – Winston 10. This was the reserve grand champion and champion extra heavyweight exhibit, a Charolais steer weighing 562kg with 11mm fat after 120 days on feed. Winston, having been bred and donated by Jim and Belynda Quilty, Elgin Park Charolais, Elgin and prepared ex gratia by Peter and Judy Milton, Dardanup, as this year’s Black Dog Ride charity steer, was sold commission free through Landmark with auctioneer Tiny Holly on the gavel. It was the 10th steer prepared by the Miltons for the mental health awareness campaign since 2011 and it sold for $8000 which will go to the Black Dog Ride charity which raises awareness of Mental Health in the rural community. For more information on the Black Dog Ride – click here.